The Victorian novelist and outspoken supporter of social reform Charles Dickens died 140 years ago on 9 June, 1870, so I thought it might be a good time to share this souvenir postcard of the The Dickens House Museum appropriately printed by one of Britain's most famous postcard publishers Raphael Tuck & Sons. 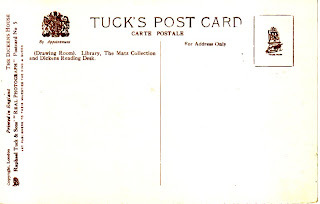 First established in London in 1866 selling pictures and frames, it was only when Raphael Tuck was joined by his three sons and in particular the enterprising Adolph that they began publishing greeting cards in 1871 and then postcards in 1894. Curiously, the early career of the company as a postcard publisher was closely associated with the life and works of Dickens - in the early 1900s they had launched a series of Oilette souvenir views of places associated with the writer called In Dickens Land. This real photograph postcard features the Drawing Room at 48 Doughty Street, London which had been home to the Dickens family between 1837 and 1839, when Dickens first became famous. 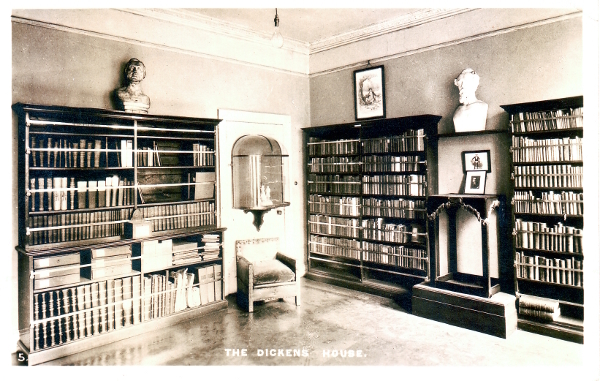 The Dickens Fellowship purchased the property in 1925 at the encouragement of a leading Dickensian and scholar B.W. Matz with the scope of preserving the house as a Dickens shrine and as a National Dickens Library and Museum. In fact, it has been upon to the public ever since and the drawing room houses the Matz Collection. 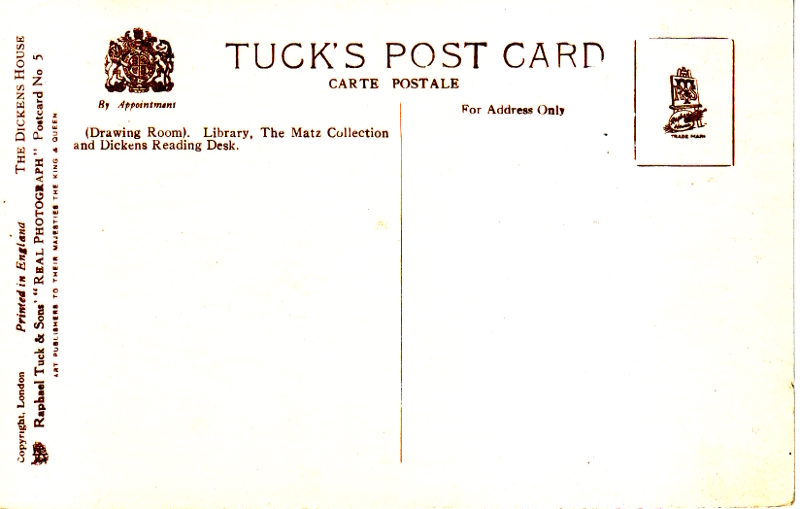 This postcard is uncirculated so I can only hazard a guess at when it was issued as Tuck's was operational until at least the mid 1960s. Back in 1893 the firm had been awarded with the Royal Warrant by Appointment to Her Majesty Queen Victoria and their postcards were always emblazoned with the Royal Coat of Arms, a distinction they continued to win until Queen Elizabeth II ascended to the throne. This postcard reads "Art Publishers to their Majesties the King and Queen" and I believe the King referred to here is either George V who reigned until 1936, or George VI who succeeded him after the abdication of Edward VIII putting this card in the 1930s. On 29th December 1940 in a devastating air raid Raphael House, the home of Tuck's Postcards, was heavily bombed, destroying all their records and most original photographs in their archives. Thankfully, their postcards had been sent (and collected!) in their millions meaning that at least part of that heritage was saved and the company was able to rebuild and enjoy several more decades of successful publishing. I would have liked to visit the Raphael House, along with a number of other wonderful landmarks that were bombed in various wars. Sigh. It is good that we at least have a postcard record.